If I’m not Filipino and I’m not Nepali, What am I? I’ve always been aware of my lack of cultural identity. I’m Filipino by ethnicity and citizenship and Nepali by osmosis. In terms of culture, I feel like I don’t have an anchor. If I’m not Filipino and I’m not Nepali, what am I? I’m a former expat kid. I was three when my dad’s work brought us to Nepal. I could say I felt more Nepali, as I was fluent in Nepali but not in Tagalog, went to a local school, and celebrated Hindu & Newari festivals, but the truth is I’d felt just as odd in Kathmandu as I do in Manila. My brother and I were the only non-Nepali kids in our whole school and the only full-Filipinos among our non-school friends. When we moved back to Manila a few months shy of my ninth birthday, classmates called me maarte because I couldn’t speak Tagalog. If we’re with our Nepali friends, who consider my brother and I as one of them, I feel horrible because I don’t understand Nepali anymore. When Manila friends talk about home towns/provinces, I immediately think of Kathmandu. But when I visited Nepal a few years ago, I nearly had a breakdown at the entrance to one of the UNESCO Heritage Sites because I realised I wasn’t a local anymore. I was a tourist, being charged exorbitant tourist prices because I couldn’t speak the language anymore. So if I’m not Filipino and I’m not Nepali, what am I? It was a cousin, who’d spent most of his childhood in Tanzania and Kenya, who first introduced the term Third Culture Kid to me. Third culture kid (TCK) is a term used to refer to children who were raised in a culture outside of their parents’ culture for a significant part of their development years. …The first culture of children refers to the culture of the country from which the parents originated, the second culture refers to the culture in which the family currently resides, and the third culture refers to the amalgamation of these two cultures. …Third culture individuals can also be referred to as cultural hybrids, cultural chameleons, and global nomads. Christmas pageant at my preschool. With the popularity of low-cost carriers, international travel has become a huge thing among people my age. Which is great, don’t get me wrong. I don’t think I could have afforded to go back to Kathmandu if not for LCCs, but it also comes with this romanticisation of being rootless, of being restless, of wanderlust, which annoys me. I feel like a lot of people romanticise these ideas but don’t think of how disjointed and othered it can feel. I know it makes me sound like a hypocrite since there’s nothing I love more than visiting other countries, but I think what makes travel great is the concept of home. I’ve been living in the Philippines for 20 years now, and it still doesn’t feel like home. It still feels temporary. Posted byGab 29.Mar.2016 06.Dec.2016 Posted inOh How I Ramble OnTags: cultural identity, expat, expatriate, featured, kathmandu, Manila, nepal, Philippines, TCK, Third Culture Kid10 Comments on If I’m not Filipino and I’m not Nepali, What am I? Back in Manila for four days and I already feel so very homesick for Nepal. This has been a trip seventeen years in the making and now that it’s over, I feel like I’ve left a huge part of me there. I always thought that this trip would get rid of its tug at my heart, but if anything, it’s actually made it stronger. I look forward to getting the chance to visit again. There’s so much I want to say, but I don’t think I’m coherent enough at the moment to say it, so I will instead leave you with some of my favourite shots from the trip. Brightness and contrast slightly tweaked in photoshop because I only brought a point-and-shoot camera. My biggest regret was not bringing my film SLR. Some of my best friends growing up spent the Christmas holidays here in Manila and they brought something we have been craving for ever since we got back from Nepal ten-something years ago — TITAURA. 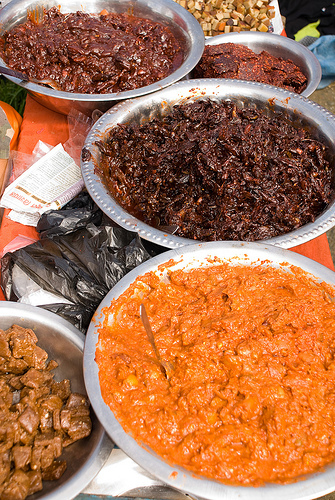 Mostly made from dried Lapsi, the Nepali Hog Plum, various other fruit, chili and spices, Titaura is usually sold in the Nepali equivalent of sari-sari stores. It’s got a pretty bad rep. We were all discouraged by parents and teachers from buying it because it’s supposed to be un-hygienically made, so of course we’d buy from the store next to our house everyday after school. The brother and I are trying to make our one bag of titaura last, but it’s very difficult (for me especially) to stop eating once I’ve started. Salty, sweet sour, spicy goodness, mmmm.